I used the digi set Spring Peeps which comes with 3 adorable images and 3 matching sentiments. I printed the peep and colored with Copics, then paper pieced the shell. The sketch is from Tuesday Morning Sketches. We hope you’ll play along! Just remember, you must use a C.C. Designs stamp, including - AmyR, Mashi's Muffins, Sweet November, Lil Lads & Lolitas & Webbie's Words. TFL! I used Asha from India as well as the Grass Die from YNS. Asha’s skin and hair were colored with Copics and all the rest was colored with colored pencils and OMS. The tree is a premade embellishment from Basic Grey and I computer printed the flag sentiment. Please stop by the YNS Blog for all the rest of today’s fun! TFL! Isn’t she gorgeous? LOVE her!! I didn’t want to take anything away from the image, so I just put her on a card base and left it at that. This is also for Digital Tuesday – Pink and White. I hope you like it and TFL! I used Cracked Lula and a sentiment from an old Stampin’ Up! set. Lula was colored with Copics and colored pencils with OMS and the egg was paper pieced. The sketch is from Lucy's Cards and the papers are from the Sweet Afternoon paper pad by Teresa Collins. We hope you’ll play along! Just remember to use a C.C. Designs stamp, including - AmyR, Mashi's Muffins, Sweet November, Lil Lads & Lolitas & Webbie's Words. TFL! Janet Zeppa who said: "I could see using it every season for different reasons. I have 2 grandnephews that love to get treats!" and Michelle who said: "This die would be awesome!!! I am always making stuff for the gals I work with and they love it when I do. Also, my 7 yr old granddaughter LOVES crafting with me and this would an awesome thing for her to do with me! Thanks for the chance to win it :)"
Congratulations ladies! Please email me (addy is on the right) with your mailing addresses so I can get your dies sent out! Thanks again everybody! It seemed to fit the image so I used it again. It’s from the YNS set Heartfelt Sentiments. This is a digi image called Chibi Lily Sending You Sunshine. Isn’t she adorable?! She was colored with Copics and cut out with a thin white border. Then I foam mounted her on a piece of patterned paper from the Teresa Collins Sweet Afternoon paper pad. Finally I added a bit of Timeless Twine to finish it off. This is for Alicia's Challenge #3 – use decorated paper and an image from Alicia’s Little Shop. I hope you like it and TFL! P.S. I forgot to say that the image does not have a nose - I drew that in just because I felt like it! I cut the fishtail flag with the Fishtail/Banner die set and the sun was cut with the Whatnots Seasons Set One die set. I sewed the flag straight onto my card and distressed the top edge with my fingernails. Then I foam mounted the sun on the flag. I stamped a lovely sentiment from Heartfelt Sentiments over the flag to finish it off. I hope you like it and TFL! I stamped the vampire from Spookalicious and colored him with copics. I added a heart from Word Salad (that’s also where the sentiment is from), and colored the heart and his teeth with red Stickles. Finally I cut him out and foam-mounted him on a doily from Cheery Lynn Designs. This is for Paper Smooches – PS project with a heart; Bellie Challenge – Valentine’s/Hearts (the red Stickles are my old, forgotten ‘belli); Divas by Design – Love and Romance. I hope you like it and TFL! I colored Sweet November Bonnie with colored pencils and OMS and used some really old Making Memories papers and a brad to finish off the card. The sentiment is from Papertrey Ink. The sketch is from Lucy's Cards. We hope you’ll play along with us! Just remember that your project must use a C.C. Designs stamp, including - AmyR, Mashi's Muffins, Sweet November, Lil Lads & Lolitas & Webbie's Words. TFL! I used the Whatnots Seasons Set One dies to cut the shamrock out of green felt and added a brown button on top. The rest of the card was generated in and printed from Make-The-Cut. You’ll notice it’s printed in brown ink to match the cookies. We hope you’ll play along with us! Check out the YNS Blog for all the details. TFL! Hi all! I’m back with another entry into the Papertrey contest. This time I was inspired by the second-to-the-last project by Heather Nichols – the snowflake tag. I am always inspired by Heather’s use of white ink on kraft cardstock so that’s what I did with my tag (cut with an old Sizzix die). I stamped a border from Beyond Basic Borders and added a sentiment from Around & About Sentiments (both sets were designed by Heather – love her style!). Finally I added a bit of ribbon tied with rustic jute button twine. I hope you like it and TFL! The Thanks die is from Quickutz and I stamped with a mix of border images from Papertrey Ink. Instead of spraying the color on (which for me just came out splotchy and uneven), I sponged the color all over. I hope you like it and TFL! The fish stamp is an old one from A muse Art Stamps and the sentiment and stars are from Birthday Buddies. To finish it off I sewed a thin strip of matching cardstock on the bottom. I hope you like it and TFL! Hi all! Sorry for so many posts in one day but I’m trying to play catch-up with posting all my CS2 homework! Should’ve posted sooner! I used the Women of Life set from Papertrey and inks from SU! The inking didn’t come out very vibrant so I’d like to do this again with darker inks, but I’m still pretty happy with how it came out. I used the Insta Love Polaroid die set, a Martha butterfly punch, and some a muse|studio twill to finish off the card. Oh, and I also embossed the base card with the woodgrain folder from SU! I hope you like it and TFL! Hi all! I have another CAS card for you today. This one was based on Kelly Rasmussen’s card (although I just used a piece of patterned paper for the inside instead of sponging a design). I stamped a sentiment from Kick Some Grass around the cut out circle and sewed a strip on the side. Finally I mounted this panel with foam tape. I hope you like it and TFL! The butterflies are from Flap Happy (and I used the Butterflies 1 dies to cut them out – I LOVE that Paper Smooches has dies now!!) and the sentiment is from Word Salad. The sentiment is from Flap Happy and I used my Tombow Watercolor Pens to put down the color. Maybe I’ll be back another time with a plaid stamping card if I ever find a color combo I like! Until then, TFL! It’s from Great Impressions and is called Peeking Sunflower. I got it forever ago and haven’t inked it up until today! I also used the Word Salad set from Paper Smooches for all of my sentiments. I also did 3 different card sizes using 3 different coloring mediums! You can’t tell from the picture, but the whole sunflower square is popped up on foam squares. The plain green squares looked a little naked, so I actually stamped the same image in matching ink as a background. It’s a little crooked, but oh well. I guess you could say I used the same stamp 4 ways! I’m not sure if I’d ever attempt this again, but I have to say that it was a great experience! I hope you like my cards and TFL! Both stamps are from Flap Happy by Paper Smooches. I cut the butterfly out of polka dot patterned paper with Butterflies 3 dies and then stamped the butterfly over it. It was then sewn onto the circle panel with a straight stitch. The flag was also sewn on and the ends slightly curled up. Finally I stamped the sentiment. This is for the Paper Smooches SPARKS challenge – polka dots and the sketch is from Tuesday Morning Sketches. I hope you like it and TFL! I used Pretty Phrases and some pigment inks from a muse|studio. It’s hard to tell but the top of the card is covered in a fine layer of glitter and those dots around the sentiment are Stickles. To finish it off, I sewed a strip of matching cardstock to the bottom of the card. I didn’t try the other card that’s totally covered in glitter because I was having issues with glitter rubbing off of this card, and would rather not have a completely untouchable card! This next card used Jennifer’s paper pleating technique which was really fun! I used the Leafy Branch embossing folder and a sentiment from Sentiment Sampler. I brayered the card with dye-based ink instead of paint and added a little Stickles to each leaf. I finished off the card with some white twill. I used another sentiment from Sentiment Sampler and a bunch of different washi tapes from my stash (really love that cupcake one!). I finished off like Lisa’s with the twine wrapped flag, although I added a bow to mine and left off the flower piece. I really like this use of washi tape and will try this again in the future! Whew! That’s a lot for one post – thanks for sticking with me ‘til the end! All of the papers are from the Sweet Afternoon paper pad by Teresa Collins. The fishtail flag was cut with the Fishtail/Banner Die Set and the heart is from the Whatnots Seasons Set One. The sentiment is from We Connect and was stamped in grey ink and cut out by hand. I finished it off with a tiny bit of machine stitching at the top of the flag. I hope you like it and TFL! Hi all! Papertrey Ink has a number of fun contests going on right now and I decided to try one out today – to be inspired by the PTI designers. The one I’m sharing today was inspired by the third card from Cristina Kowalczyk. The butterfly is from Butterfly Dreams, the sentiment is from Vintage Picnic Sentiments and unfortunately I have no idea where the leaf spray is from. :( It was just sitting all by its lonesome in my craft room and I decided to use it. If you recognize it, could you please leave me a comment? I stamped on PTI’s kraft cardstock and then cut the butterfly out with the matching PTI die and mounted it on foam tape. I hope you like it and TFL! It’s a 1x8” cello sack filled with M&Ms and topped with a bit of patterned paper stamped all over with a sentiment from Love Nuggets. The image and sentiment (as well as the image from the next card) are from Cyber Cafe from Paper Smooches. I stamped the cup on patterned paper, cut it out and mounted it with foam boosters. The sentiment was stamped underneath and I machine sewed on a thin piece of matching paper to the bottom. I stamped the sentiment first and then stamped the beans around it with 2 different shades of brown ink. Finally I machine sewed on a hand cut strip of patterned paper to the side. On a side note: I recently came across the blog of Marcy Penner and am completely in love with her style!! I can’t possibly even imitate her creativity, but I will be trying to find little bits and pieces of her style that I can replicate in my own works. I got the sewn-on strips above from her and love them! TFL! Hi all! If you’re looking for the winners of my Lollipop Cover die giveaway, please click here. My card was based on Shari’s except I didn’t stamp on labels for the background. Instead I just cut up strips of patterned paper. All the stamps on this card are from Cyber Cafe. TFL! I did a reverse mask for the bees and sponged the yellow ink inside. The bees and sentiment are from the Bee Mine set and the trail stamp is from Flap Happy. I stamped the sentiment from Pretty Phrases on watercolor paper with Graphite Black ink and did the technique using my Tombow watercolor pens and a waterbrush. I masked off the strip with Eclipse Masking Tape. I really like how this one turned out and plan to do more. TFL! I stamped the bear from Chubby Chum Pals and colored with Copics. The sentiment is from We Connect. The sentiment is from Sentiment Sampler and the word bubble is from He Said, She Said. The striped strip on the top is washi tape and the little spots are pink glitter. 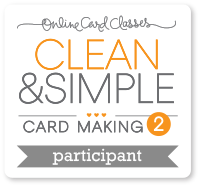 If you want to know more about making CAS cards, I highly recommend this class – I’m learning a lot and getting great inspiration! TFL! Hi all! I'm here just to announce the winners of my Lollipop Cover die giveaway. Congratulations! Please email me with your addresses so I can get your dies out to you! Thanks everybody for your wonderful comments!